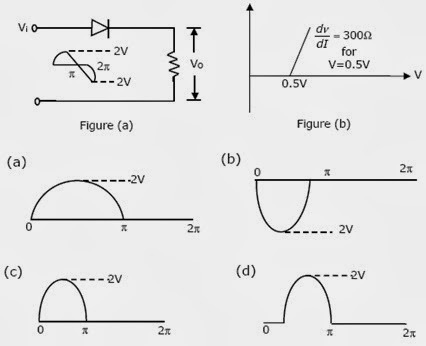 Previous GATE Questions on Diode - 2 includes forward bias, reverse bias, V-I characteristics, static and dynamic resistance, effect of temperature on Io and diode voltage. where V1 and V2 are the voltage drops across the diodes D1 and D2. 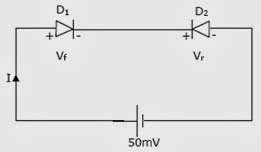 (b) Assuming that the current through the reverse biased diode is saturated at Io, calculate the Voltage drop across the forward biased diode. Assume KT = 26meV. b. If the reverse saturation current , IS , for the diode is 1pA, then compute the current I through the circuit.